If you’ve ever taken a study trip to Israel, one of the first sites you may have seen was Gezer, only a few miles from the airport in Tel Aviv. 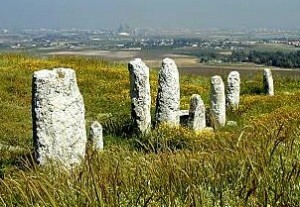 There you will find a group of ancient standing stones (matzebot in Hebrew) that date from 1500 BC, when the Canaanites were in the land of Israel. They were part of the ancient practice of erecting stone pillars at pagan worship sites, and were often involved in worship of heavenly bodies. The practice dates from at least 5000 BC. Many sacred stone sites from 3000 BC and older can still be found in the Negev and Sinai desert, as well as around Europe and elsewhere. Stonehenge, from around 2500 BC, is another example. But Gezer was a very strategic city and only rarely were Israelite kings in control of it (Judges 1:29, 1 Kings 9:16). So during very little of Israel’s ancient history could they have knocked down the stones of Gezer. Interestingly, Jacob used this same practice to worship God after he had the vision of the heavenly staircase. There he erected a stone, anointed it, dedicated it to God and called it Bethel (Genesis 28:18-28). Why? The difference was the motivation – whether the stones were set up to point people toward God, or to worship idols. With the bronze serpent, the same situation happens, but in reverse. When the Israelites were bitten by snakes in the desert, God commanded that a bronze serpent be hung on a pole. The people who looked at it in faith would live (Numbers 21:9). But later in history, the bronze snake became an idol, so it had to be destroyed (2 Kings 18:4). You might think that if God commanded a worship practice, it would be permanently holy. But the fact that its origins came from God didn’t sanctify it when it was being misused. Once again, the motivation of the people, not the origins, determined whether something was idolatrous or God-honoring. These biblical examples can give us wisdom about the holidays of Christmas and Easter. These holidays began as Christians decided to worship the true God on days when pagan gods used to be worshiped. Some traditions, like the Christmas tree and the Easter egg, once had pagan meanings that are now lost. Over time they’ve become holiday traditions, although they have no significance in worship. Should we avoid these observances? There are some people who have rejected Christmas and Easter entirely because of their origins. But the biblical examples of the standing stone and bronze serpent show that the critical thing is not what the origin of a practice are, but whether we are worshiping the one true God. To most Christians, these holidays glorify God like the standing stones by the Jordan did. They are a continual reminder of the wonderful thing God has done by sending the promised Messiah, who saved us by suffering and dying for our sins. I am reminded of 1 Samuel 16:7 which says, “for the LORD seeth not as man seeth; for man looketh on the outward appearance, but the LORD looketh on the heart. The LORD looks at our heart; He looks at our motives. He knows if we are worshping the One True Messiah who stepped out of the glory of Heaven to be born in a cave and placed in a stone manger. God knows our hearts. I am breathing a sigh of relief. I have spoken often in past months about whether or not traditional Christian holidays can mean as much to us as Biblical feasts. I have found myself saying, “I will take any day to praise God and bring glory to His name.” Yet I have felt uncomfortable with the origins. Thank you, dear Lois, for illuminating a perspective that rings valid in my soul. Let’s fill our calendar with Biblical appointed times, Christian traditions, and all the Shabbats in between! Perhaps we’ll never be more than a few days away from a sacred time of glorifying God and His Son, our Savior. Amen. I guess it’s like Paul says in Corinthians, that if your faith leads you to regard a certain day as holy, you do it for God’s glory. And if your faith leads you to regard all days the same, you also do that for God’s glory. It need not be a source of division, but everyone is to respect one another’s opinions of these matters. The important thing is whether or not our hearts are right with God and to preserve the unity of His people in the love that He died to give us. I could agree with your conclusion except for one thing. YHWH specifically commanded the Israelites to set up the stones for remembrance and to make the bronze serpent. No where in Scripture are we commanded to remember our LORD’s birth or to worship Him with Christmas trees or Easter sunrise services. It seems to me that there is a huge difference between the LORD commanding us to do something, even when that something sounds similar to a pagan worship practice, and our own decision to incorporate pagan worship practices into our worship of the One True God. As for me, I will continue to NOT celebrate Christmas or Easter in favor of those holy, set-apart days which my Father God has clearly commanded in His Word and which Messiah Yeshua upheld in practice while He walked amongst us. I will walk as Yeshua walked and I am quite certain that He kept every commandment of YHWH, including the holy, set-apart days, but find not even the vaguest reference to Him observing His birth day, whether on December 25 or on any other day. Not a very good correlation between your biblical examples of the stones and the serpant to Christmas and Easter. You will NEVER find The Most High telling his people to take something that is already an idol and “flipping” it for worship to Him. Quite the contary. Deut 12:2-5 “You shall utterly destroy all the places where the nations whom you shall dispossess serve their gods, on the high mountains and on the hills and under every green tree. You shall tear down their altars and smash their sacred pillars and burn their Asherim with fire, and you shall cut down the engraved images of their gods and obliterate their name from that place. You shall not act like this toward the LORD your God. But you shall seek the LORD at the place which the LORD your God will choose from all your tribes, to establish His name there for His dwelling, and there you shall come.” (v29-31) “When the LORD your God cuts off before you the nations which you are going in to dispossess, and you dispossess them and dwell in their land, beware that you are not ensnared to follow them, after they are destroyed before you, and that you do not inquire after their gods, saying, ‘How do these nations serve their gods, that I also may do likewise?’ You shall not behave thus toward the LORD your God, for every abominable act which the LORD hates they have done for their gods; for they even burn their sons and daughters in the fire to their gods.” — This clearly teaches us that we cant take a pagan practive and say we will worship the Most High in the same way… We worship Him the way He tells us to. Cindy, thanks for your comments. I agree that no one knows about the day of Jesus’ birth, and that attempts to pin it down (including that it was on Sukkot) are speculative and beside the point. One point he makes is that just because a celebration is post-biblical doesn’t mean that it is anti-biblical. In orthodox Christian tradition, Christmas is a celebration of God’s fulfillment of his promise that he would enter into this world in order to redeem it. Of course Jesus didn’t celebrate it himself, but he is the center and focus of the whole thing. I agree with you that all Christians would be enriched by learning more about the biblical feasts and even celebrating them. But I think it’s unfortunate that instead of focusing on sharing this new idea, so many pour themselves into denouncing “pagan” traditions that only a few years before, they themselves found deeply worshipful. Jason, the point of my article is to note that standing stones are exactly what you say God would never allow. In fact, God tells people never to put them up, and tear down the ones they do find. And yet God tells people to use them in worship at early points in their history. I should point out that cultural attitudes changed over history, and the laws about standing stones reflect that cultural change. When God instructs people to put them up, its at a point in history when they were seen as neutral expressions of worship. When he tells them to tear them down, its because they’ve become entirely associated with idolatry. The action of putting up a stone doesn’t have some magical, eternal meaning. And decorating Christmas trees doesn’t either. Thanks for your reply, Lois! While I cannot speak for every person who has abandoned the celebration of Christmas or Easter in favor of keeping YHWH’s commanded set-apart days, for myself, it was a matter of loving my LORD enough to be willing to give up the traditions of men and walk in faithful obedience to His Word instead. To me, it doesn’t matter how long the Christian Church has been keeping the traditions of Christmas or Easter; they still run counter to YHWH’s clear commands to NOT worship Him with any of the practices which the idolatrous nations surrounding Israel were worshiping their false gods with. God’s commands trump man’s traditions, from my viewpoint. When we stand before His judgment seat, I’d rather not have to answer for why I refused to give up Christmas or Easter after He had shown me quite clearly where the traditions came from or for why I had not walked in faithful obedience in keeping His holy days which are quite clearly laid out in Scripture and which Yeshua Himself observed. No,I am not a “perfect” disciple of our Master; I fail Him in many ways. However, in this I choose to walk in obedience, being not conformed unto the world, but being transformed by the renewing of my mind in accordance with His Word. I do not spend much time browbeating others about the pagan origins of Christmas or Easter. When asked, I share why I no longer celebrate those days. Conviction comes from the Holy Spirit, not from me. I have tried to express to others the joy that comes from keeping YHWH’s commanded set-apart times. As for whether I ever found the old “pagan” traditions deeply worshipful would be open to speculation. While Christmas was always the main holiday celebrated in my family as I was growing up, I cannot honestly say that it focused on the birth of Christ. For me growing up, Christmas was about Santa and getting presents. 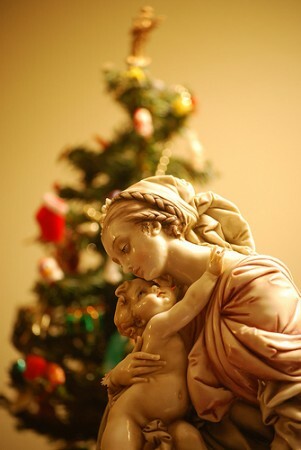 When I became a mother, I put away Santa and tried to focus on the birth of Christ for my children. Still, the traditions have a way of detracting from the purpose of His tabernacling amongst us. I would have to say that it always felt like we were falling short of truly worshiping Him in spirit and in truth. Throughout His Word, YHWH has called His people to be holy and set apart, to live differently than the world around us. In all honesty, there’s not much difference between “Christians” today and the rest of the world. Maybe we need to stop and ask ourselves just how much assimilation with the world has infiltrated our worship of the One True God. I have to believe that the LORD is raising up teachers who are revealing the pagan origins of so much in our present practice of Christianity because our loving Father God wants us to repent of our compromise with the world and return to following Him with a whole heart, holy and set-apart unto Him, forsaking the world and the things of the world, because time grows short and He wants to find a bride who has made herself ready upon His soon return. It’s not about a “feel good” Christianity, where we defend our traditions which have replaced YHWH’s clear commands; it’s about taking up His cross, dying to self, and living to Him. I can only pray that His Words to Peter would begin ringing in every believer’s heart, as they did for me, “Lovest thou Me more than these?” May we all have open ears and teachable hearts! Cindy – we appreciate your response – well put! Just recently I have been wondering if a 100% Gentile group of individuals can follow the Torah correctly ?? Here is my point — from the very beginning of YHVH’s Word being taught, it was always done WHEN the Gentile joined himself/herself to the Hebrew people. All the authors of YHVH’s Word are Jewish, the Bible is a Jewish book, written by Jewish people, and in the main for Jewish people. The Gentile could always “live among” YHVH’s people and was then expected to “live as a Jew” and “do as a Jew” and be taught “by Jews.” Many of us say we follow the Jewish Rabbi Jesus — but I fear our “minds eye” does not fully recognize Jesus as an Israeli Jew — but as a sort-of European, quasi-Jew. I think most of us Gentiles would balk at the idea of sitting at the feet of a 21st century Jewish Rabbi on a weekly basis as we do with a Minister or Messianic leader to learn (from Shabbot to Shabbot)?? This “thought” is mainly about the practice of following Torah and learning about their concept of Messiah — not learning about the Gentile picture we have of Jesus. May I remind you this is a “thought” I have recently had not an absolute “my way or the highway” conclusion. It is a matter of the heart! I keep, to the best of my ability, all the feasts of the LORD and I observe Christmas and Easter, since my brothers and sisters worship at that time. Their, and my heart, is focused on Yeshua and His coming and Resurrection. I get great joy from ALL these celebrations and find my Saviour in them all, and He meets me there. A little application of Colossians 2 would be in order here. Let the LORD judge the heart and step a little away from the letter of the Law and remember that Yeshua came to free us from that and give us the holy Spirit to guide us. Than k the LORD that Light can take over Darkn ess and make an ancient festival bend the knee to the one true LORD! Yes it does sseem, to the human mind, that a clean heart can turn once pagan prohibitions to permitted practices. David sent two loyal and trusted men Uzza & Ahio to fetch the ARK — when the Ark’s weight shifted Uzza with only clean thoughts of saving the ARK from being thrown to the ground, reached up to steady it. God killed him (“don’t touch the ARK”)no extenuating circustances, no excuses, no free pass for caring. Although you and I change with circumstances or for friends or because we are weary — God means what He says now and forever, forbidden seems to mean forbidden. If God labels it unclean it is unclean !! He is the King. I too have a difficult time remembering that fact. You sure have good posts and discussions Lois! I enjoyed your perspective and it made me think. But for me, I just decided to agree with God, I keep the biblical festivals. I never thought Easter and Christmas were deeply spiritual, in fact I kept trying to figure out the point of them. Why keep Easter and tell the Passover story? Why not just keep Passover? (and Firstfruits – his resurrection). Becoming a Christian later in life and learning my Christianity mainly from the bible, I started to become upset with some false teaching I was trying to be given like these made up holidays which Jesus would NOT have participated in. Whats the purpose? Why keep up such a ruse, if we just follow the bible, its so much easier. I just do what Paul said, and I don’t let others judge me for keeping the feasts because they are a shadow of what is to come – the body Christ! Every biblical festival tells the gospel story. I agree with whoever above said that it would be better if they kept both holidays but instead they replaced them. Jesus wasn’t to keen on practices that nullified the laws of God. Hes going to return and he will return as a Hebrew/Jewish King. As humans we just don’t like admitting we’re wrong and going back and starting over. Its ok. Teshuvah always is! Thank you all for your thoughts, but this is the final comment in this discussion. The problem with proclaiming Christian traditions “pagan” and then denouncing those who follow them is that it is divisive and judgmental. To people who haven’t learned about their Jewish roots, it comes across as condemnation of their very sincere love and worship of God. I’ve seen it several times. Communities and families are ripped apart over it. I have friends who have joined messianic synagogues who have lost contact with the rest of their families because they can’t socialize with them on Saturday or worship with them on Sunday. One very devout elderly lady I know can’t get a ride to church on Sunday morning because her son refuses to take her to a “pagan” worship service. Another family had to break up their family business over it. Yet another family I know hasn’t seen their one of their daughters for several years now. The family is spread out all over the country and everyone flies home at Christmas, but she refuses to come because of the holiday. I’m sorry, I find this really quite tragic. I know all of these people quite well, and in not one case did any of them move toward a more pure worship of God. They just destroyed the loving Christian community that God had put them in. So, I’m not going to post any more sermonettes from readers on this topic. There are plenty of other blogs where you can go to hear this view. In my morning reading I have been looking at Beit-El and the instance of the anointing and setting up of a standing stone. I get the feeling that it may already have been a place associated with Adonai that Jacob happened upon. What intrigued me was the practice of setting up standing stones. Your write was very interesting as I started comparing this practice by the Hindus’ that is carried out even today although it is in worship of other Elohims. This was very helpful. Our walks of sanctification are individual, even though we are living in community with others. I am making a change in my worship practices as directed by my personal relationship with Messiah and searching of His Word; this is the place He has brought me. We must agree in Christ crucified, resurrected and coming again; the Godhead Three in One … YHWH, Ruach HaKodesh and Logos! I so appreciated the comparisons of “standing stones” that you made. I think our motivation is so important. “Are we doing it to glorify GOD?” Too many times we build walls instead of bridges in our walk as believers. If the Biblical Feasts tell us anything, they are saying that GOD has put it in our DNA as humans to celebrate special occasions. It is sad when families don’t have fellowship and are divided because of a particular viewpoint on Scripture. I believe at times we will disagree, but let us not be disagreeable. I disagree that “GOD put it in our DNA to celebrate special occasions.” If one looks up the Hebrew Word for Feasts or Festivals it is “moe’edim” which also means Appointments as in God’s determination of when there is to be an Appointment with HIM!! He is THE Doctor we are the patient — patients do not tell THE Doctor WHEN the Appointment is to be. Rather, they must show up when HE decides. This might be characterized as following the Word not making up the word as we go along.